April is National Poetry Month. And along with the 30 ways to celebrate national poetry month, there are also memorials you can visit in Washington, D.C. that honor poets. 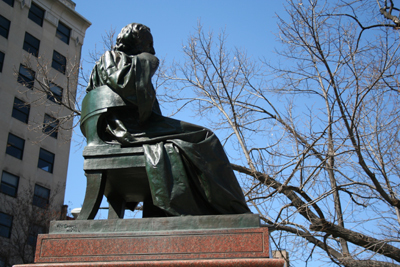 Four statues honor poets in D.C., Henry Wordsworth Longfellow, Dante Alighieri,Kahlil Gibran, and Taras Schevchenko. All are located in the northwest quadrant, and the styles range from simple to elaborate. It took twelve years for the Longfellow National Memorial Association to erect a monument to Longfellow, which was the first memorial in Washington, D.C. to honor an American literary figure. Longfellow was considered one of America’s greatest poets of the 19th century. He was born in Maine (Massachusetts at the time) and was educated at Bowdoin where he later taught. He then moved to Cambridge, Massachusetts where he taught at Harvard University. Longfellow is also remembered for his translation of Dante’s Divine Comedy. He spent several years translating the Divine Comedy, and started the “Dante Club”, that met regularly to discuss the the Divine Comedy and help Longfellow with translating. The translation was published in 1867. The Dante statue stands on the 15th street side of the lower park of Meridian Hill Park, in an area originally called “Poet’s Corner”. Dante Alighieri was a major Italian poet who wrote the Divine Comedy (Divina Commedia) considered one of the greatest poems of the Middle Ages. Although commanding, the statue is twelve feet high, and the pedestal is 9 feet high, the memorial consists only of the statue and is located at the terminus of the minor cross access. There are four benches around the statue. The statue of Dante was given to the city by Chevalier Carlo Barsotti, president of the Dante commission of New York. It was designed by Italian sculptor Ettore Ximenes, and is a replica of the Dante statue in New York City. 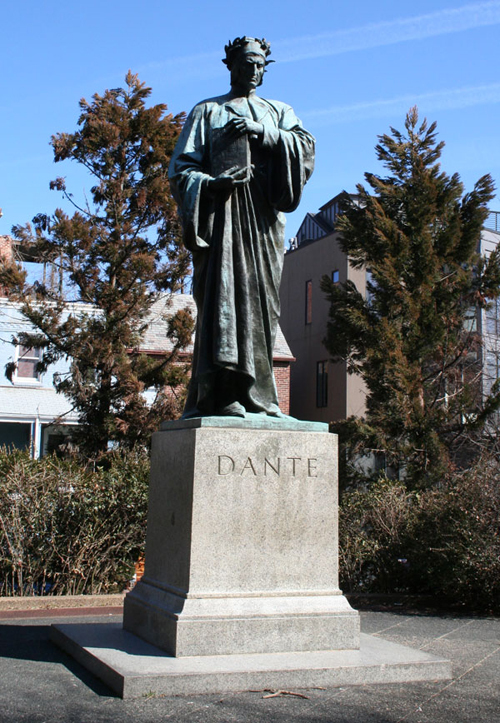 The statue, unveiled on December 1, 1921, shows Dante wrapped in a long cape, with a book under his arm. Gibran was a Lebanese-American who is best know for his 1923 book The Prophet. He also was an accomplished visual artist in drawing and watercolor. 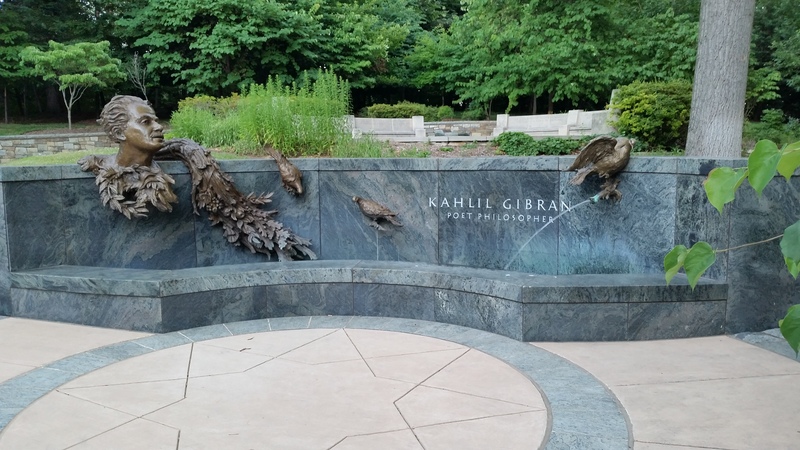 The Gibran memorial is a peaceful, recessed 2-acres at 3100 Massachusetts Avenue, NW, across from the British Embassy. To get to the memorial one has to cross a foot-bridge that leads to the entrance area decorated with a bust of the poet, a water feature and a dove. In the center of the memorial is a fountain surrounded by concrete benches. Inscribed in the benches are quotes by Gibran. The memorial is peaceful despite the Massachusetts Avenue traffic, and is especially beautiful in the spring when the flowers and azaleas are in bloom. 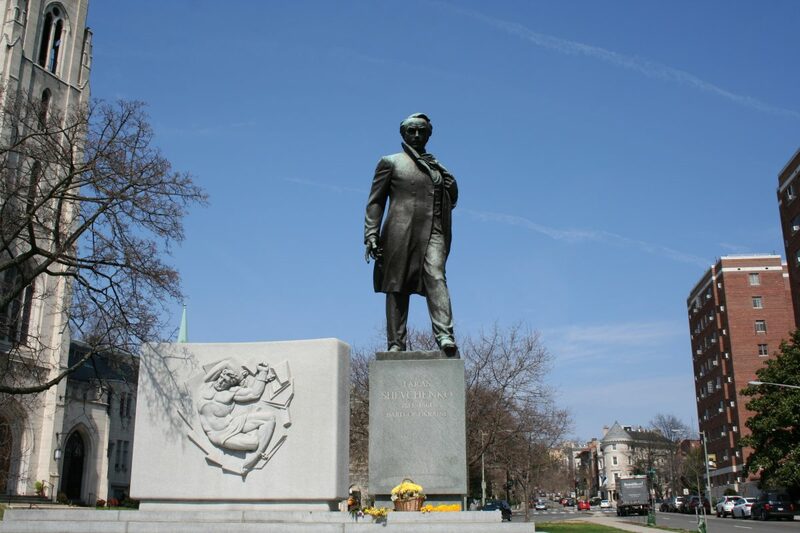 The controversial statue of Taras Shevchenko, the 19th century Ukrainian poet, was put in place in early June 1964 at the triangle park at 22nd and P Streets, NW. Shevchenko was a Ukrainian poet, writer, artist, public and political figure. His literary heritage is regarded to be the foundation of modern Ukrainian literature. The Shevchenko statue was unveiled during the 150th anniversary of the poet’s birth. The anniversary was also marked in the Soviet Union with festivities and the unveiling of a Shevchenko statue there. Sponsored by anti-Communist Ukrainian-American groups, the Shevchenko memorial was opposed by many Americans on the grounds that the poet was both anti-Semitic and the idol of the Communist Party.